Anderson, Peggy Perry. Let's Clean Up. Illustrated by author. Houghton Mifflin, 2002. When Joe messes up his room immediately after his mother has cleaned it, his method of straightening it up again does not meet with her approval. Leonard, Marcia. I Like Mess. Illustrated by Dorothy Handelman. Millbrook, 1998. Luciani, Brigitte. Those Messy Hempels. Illustrated by Vannessa Hie. North-South, 2001. As the Hempels clean up their messy house in search of a whisk to make a cake, the reader is invited to participate in deciding where various objects belong. O'Graden, Irene. Scrubbly-Bubbly Car Wash. Illustrated by Cynthia Jabar. HarperCollins, 2001. Rhythmic, rhyming text describes what happens as a car goes through a car wash.
Provencher, Rose-Marie. Mouse Cleaning. Illustrated by Bernadette Pons. Holt, 2001. Grandma Twilly cannot find the motivation to get her house cleaned, until she discovers a mouse in her house. Steen, Sandra and Susan Steen. Car Wash. Illustrated by G. Brian Karas. Putnam's, 2001. While sitting inside their car, two children enjoy the soapy sights and watery sounds of the car wash.
Teague, Mark. Pigsty. Illustrated by author. Scholastic, 1994. When Wendell doesn't clean up his room, a whole herd of pigs comes to live with him. Viorst, Judith. Super-Completely and Totally the Messiest. Illustrated by Robin Preiss Glasser. Atheneum, 2001. Olivia, who is very neat and practically perfect, despairs because her sister Sophia is super-completely and totally the messiest person, no matter where she goes or what she does. Wells, Rosemary. Max Cleans Up. Illustrated by author. Viking, 2000. Weeks, Sarah. Mrs. McNosh Hangs Up her Wash. Illustrated by Nadine Bernard Westcott. HarperCollins, 1998. 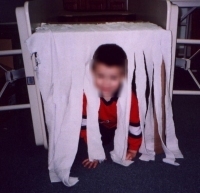 I told this story by stringing a clothesline across the room and pinning the various pieces to it. The pieces were made by photocopying and enlarging various illustrations. Because some of the pieces were relatively small, the weight of the clothespins was heavier than the piece. I taped pennies to the back of the pieces to counterbalance this. I Stink! Weston Woods, 2004. Based on the book by Kate McMullan. 8 minutes. Keeping House. Weston Woods, 1994. Based on the book by Margaret Mahy. 9 minutes. Trashy Town. Weston Woods, 2001. Based on the book by Andrea Griffing Zimmerman and David Clemesha. 6 minutes. from "Jim Gill Sings The Sneezing Song and Other Contagious Tunes"
1. Find clip art of toys, food and clothing. Put magnets on the back of the pieces. 2. Find a picture of a toy box, a refrigerator and a closet (or wardrobe). Glue these onto manila folders. 3. 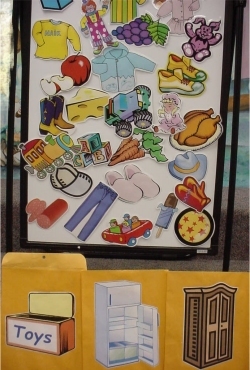 Place the clip art on the magnetic board in random (and jumbled) order. 4. I told the kids that my magnetic board was a mess and I needed their help to clean it up. They told me into which envelope each of the pieces of clip art should go. I "built" a car wash for the kids to crawl through. I used two large boxes with a space between them. The kids crawled through the first box. 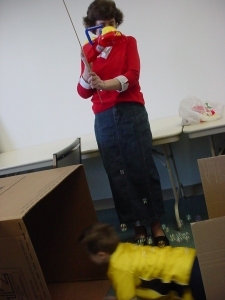 When they got into the open space between the boxes, I blew bubbles at them. Then they crawled through the second box. This box had an old towel attached to the end, which had been cut into strips. To regulate the kids going through the car wash, I attached a large stop sign to a yard stick. I had a parent hold the stop sign down until it was time for the next child to enter the car wash.
Left: A teacher regulates the "cars" as they pass through the car wash. Right: A "car" gets bubbled in the car wash.
*You can also used fingerplays, songs and stories about taking a bath. Some can be found in the "Bath" unit in A Storytime Year. Use the pattern to cut shirt shapes from coffee filters. Have kids scribble on them with washable markers. Using a spray bottle, wet the shirts. The marker will bleed to create a tie-dye affect. I did the craft at the beginning of the program so that the shirts could dry. 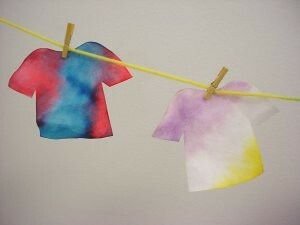 Then the kids hung their shirts on a clothesline with miniature clothespins purchased at a craft store. You could also let the kids add stickers or vinyl numbers/letters to further decorate their shirts. 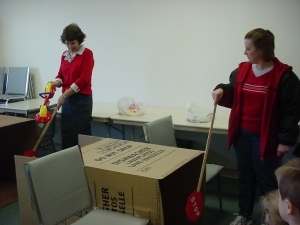 * "Cleaning My Room," and "Washing Clothes," which were written by Susan M. Dailey, can be used freely in programs, but may not be re-posted, reproduced, or sold without prior permission.